So what are buying and selling cycles and why are they important to sales people? Let’s start with the customer’s buying cycle. (Note please click slides for larger views). 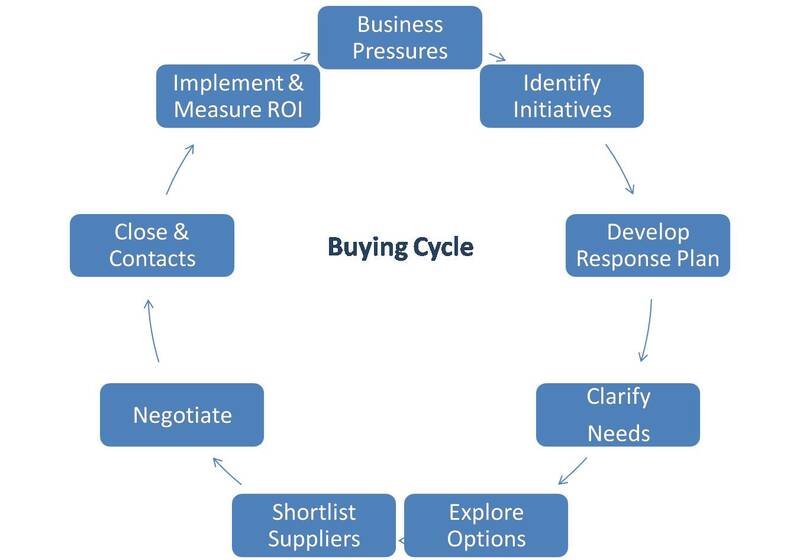 The buying cycle is the steps in the process that the customer has to work through starting with idea of doing something (an awareness of needs) through to implementation and achievement of results. This is a customer internal process that needs to be respected by sales people trying to short cut the process to a quicker order. In customer interviews this is one of the most heinous crimes that sales people commit – not taking time to understand and work with the customer’s buying cycle. So what are the advantages of understanding the buying cycle for a sales person? Well, firstly, they all differ – every customer is different, and so to sell well, we need to know what the customer is doing at each stage. This allows us to align our selling efforts with the appropriate buying steps. So, if the customer is still clarifying their needs, if the sales person puts in a proposal it is likely to be inappropriate as it is based on incomplete information. Similarly, if the customer is evaluating options, trying to close them can only make them angry and less likely to buy from you. So, as a selling organization, you should have a sales cycle. These are the steps (the process) that you go through to ensure the best chance of winning the business. Sales organizations with a well defined sales process have a far better chance of executing business effectively and efficiently. These are the steps that are often linked to the stages in a CRM system for the % chance of winning the business. This process ensures that nothing is missed out, especially early in the cycle. Knowing your own selling cycle and the customer’s buying cycle allows you to analyse whether the actions you are taking are synchronised with the customer’s actions. Again, the better the synchronisation between you and the customer, the better your chance of winning the business. Throughout the process there should be an ongoing qualification of the prospect – are we talking to the right people, who will make the decision, how will it be made, what criteria will they use, etc. Interestingly, there is no timescale on these processes, and in some cases the whole cycle can be completed in one telephone call, whereas the process could take 50 meetings spread over 2 years. This is why it is important not to use generic processes (like the ones I have created), but to actually understand the real customer process. This entry was written by John, posted on May 7, 2010 at 3:37 pm, filed under Customer Focus, Sales Process and tagged business issues, customer commitment, proposal, sales competencies, sales person. Bookmark the permalink. Follow any comments here with the RSS feed for this post. Post a comment or leave a trackback: Trackback URL.